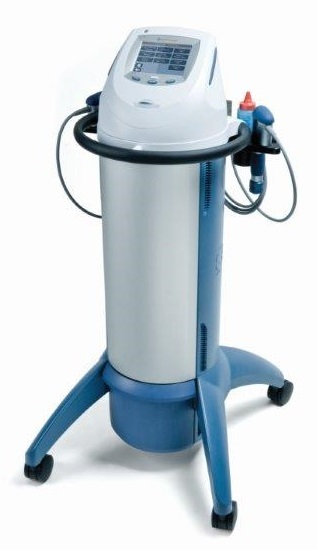 Radial Shockwave therapy is a series of high-energy percussion to the affected area. The shockwave is a physical shock, not an electrical one. It is a radial shockwave that is pneumatically generated and transmitted into the tissue. A shockwave is an acoustic pulse, not an electric one. The body responds with increased metabolic activity around the site of pain. Re-absorption of irritative calcium deposits in tendons. Shockwaves locally alter the chemical environment. This stimulates the healing process, and reduces pain. Proven to be effective for chronic heel spurs and plantar fasciitis, tennis elbow, achilles tendonitis, calcific shoulder tendonitis, frozen shoulder, patellar tendonitis, and chronic low back pain. What are the benefits of Shock Wave treatment? This therapy works without the use of x-rays or drugs; it stimulates the body’s natural self healing process. There is usually an immediate reduction of pain and improved ease of movement. Secondary effects are minor. Shockwave therapy may also eliminate your need for surgery. 2000 shocks are typically administered per session, which lasts approximately five minutes. It takes 3-6 treatments, one week apart (maximum 10 days). Treatments last for approximately 15 minutes. Each treatment session takes approximately 15 minutes. The treatments are done 5-10 days apart, depending upon the patient’s tolerance and their tissue response. The treatments are uncomfortable but tolerated by everyone. Your therapist will adjust the settings to best suit each patient. Will it hurt after the treatment? Are there side effects? As you leave the clinic, you will most likely be feeling no pain but you may experience throbbing pain 2 to 4 hours following the treatment. This throbbing pain may increase for up to 24 hours. In some cases it can last up to 48 hours and in very rare cases, the pain may last up to five days. There may be irritation or swelling but it usually disappears within days of treatment. Shockwave will trigger an inflammatory response which is the body’s natural process of healing. For this reason, do not use any anti-inflammatory medications. Do not use ice. The pain should subside within 24 hours. Use Tylenol if necessary. We also recommend magnetic biostimulation after shock wave to speed healing. Some patients feel significant results after the first treatment. Some patients will not feel a difference until finishing their recommended course of care. The healing process is accumulative and therefore patients continue to have results weeks after ending their treatment. Because the cells are broken down, and are rebuilding (they actually are put back into the acute phase) the maximum relief is usually felt at the 12th week after their last treatment. The treatment is very effective, quick, and reasonably priced. Individual treatments are included in your physiotherapy session fee of $150 each. The treatments are provided by our Physiotherapist and will be covered by extended health care plans that pay for Physiotherapy treatment. Some employers may pay directly for the RSWT treatments for an employee. WSIB may cover chronic cases, patients should consult with their case worker. Why use Radial Shock Wave Therapy? A great option instead of surgery, that has a long recovery time, more rehab, and lost work time, lost income, and reduced quality of life/lifestyle while they recover. Surgical success rates are much lower than the RSWT proven results. Eliminate the use of medication. Eliminate the use of cortisone, or repeated injections. Used when all other methods have failed. Athletes who want to return to their sport and suffer from chronic pain. Has Radial Shock Wave been clinically proven? One placebo-controlled study into the efficacy of ballistically generated shock waves in the therapy of tennis elbow and calcaneal heel spur concluded 88 percent of patients assessed their therapy as “very good” or “good after treatment. In a follow up survey 12 months after their last treatment, 95% of the tennis elbow, and 94% of the heel spur responded that they were still very satisfied with their results. Radial shock wave therapy is a series of high-energy percussions to the affected area. The shockwave is a physical shock, not an electrical one.